TCM knows the complexities of the evolving mass media world. We recommend attendance at local seminars on media relations. These organizations can be extremely helpful in the continuing mass media learning curve. The Calvert County Health Department in southern Maryland retained Thieme Creative Media for our media relations expertise. 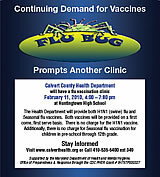 We designed the above direct mail postcard that was mailed to all county residents. We coordinated the printing and bulk permit distribution. We composed editorial media alerts for both print and online mass media outlets. Thanks to a great commitment from Dee Jay Gude of Southern Maryland Online, the Calvert Health Department saw their important media alerts on the portal's HOME page — in a prominent position. We were able to track how many readers of Southern Maryland Online 'clicked through' to the Health Department's website. Additionally, we created and placed in rotation an animated banner advertisement on SOMD. Dee Jay indicated that while most public service announcements only capture a 1% click-thru rate, our PSA generated a 3% click-thru rate. 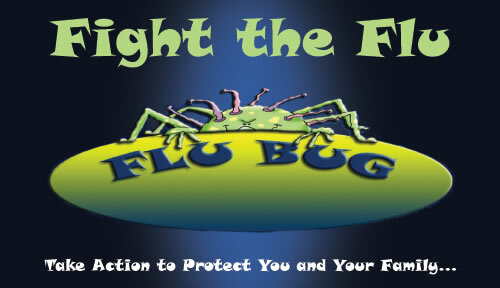 Consumers responding to the animation, and clicking on the banner ad, were taken directly to the Health Department website. Thieme Creative Media convinced area weeklies to carry a press-quality PDF of a design and layout generated by TCM for the respective newspaper. Additionally, TCM was asked to handle a modest media buy initiative with the local newspapers. TCM also provided suggestions on the Health Department's website editorial content, created special media alerts for an area radio station, and provided photojournalism services at a few of the Health Department flu clinics.